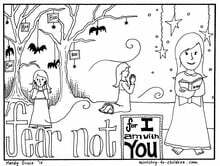 These printable Halloween coloring pages will remind children that God can overcome their fears. We wanted to create new material that featured a biblical rebuke to fear, such as Isaiah 43:5 that would help kids overcome fear. They were created by illustrator Mandy Groce. There are two versions of this coloring page about Halloween. One for boys and a second for girls. Each has the child surrounded by all the scary decorations related to Halloween. 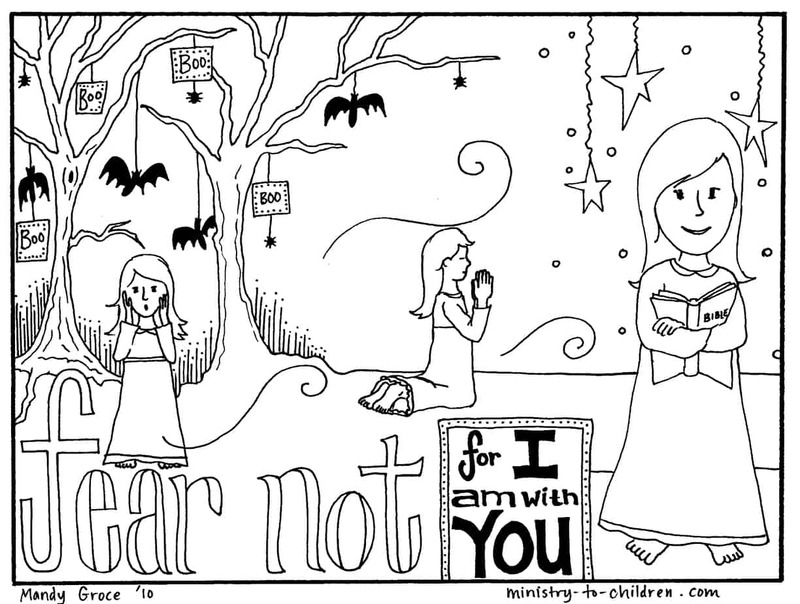 But surrounding them is this powerful Bible verses from Isaiah 43:5, “Fear not for I am with you.” This is one of the simple memory verses that every child needs to know. 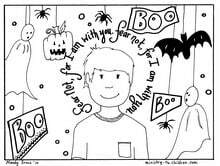 This coloring page is perfect to pass out at a fall festival or church trunk or treat. You could even incorporate it with a Bible lesson about fighting fear. Some families might include this page with the candy they pass out at home on Halloween. Your feedback is welcome. Just leave a comment to let us know how you will use this free coloring pictures. If you like these, you might also enjoy Mandy’s Armor of God coloring pages or her series of creation coloring pages. We’ve heard from many readers who pass these out along with candy during this time of year. 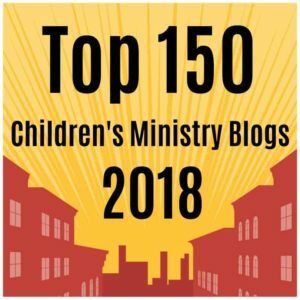 It’s not a full Gospel presentation, but it is a subtle way to point kids back to God and away from the spirit of fear. 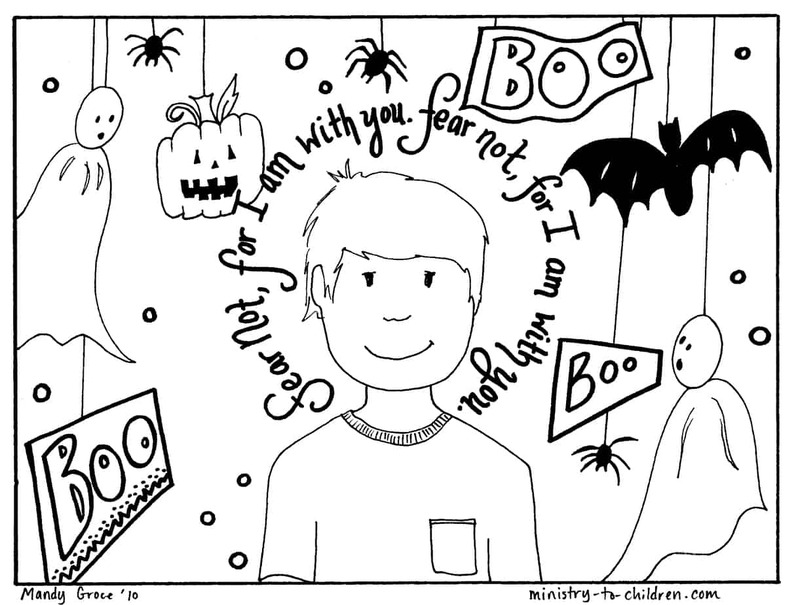 Don’t miss our popular Bible lesson “Fear Not” for Halloween. point, we are giving Satan praise not Our Lord and Savior on that day. Boy that’s guy with a real sense of humour and fun, isn’t it?!! Rather dictatorial of him to try to take away a childhood fantasy day because of his own small judgemental mind! Did he learn this in theology school? Too bad he can’t find a positive approach to recognizing Satan can’t be managed by outlawing Hallowe’en! Well, I know this is much later than your comment posted, but I disagree. We have a fall festival at our church each and every Halloween because the best offense is defense. We play games, eat hot dogs, have cake walks and hay rides all while sharing the love of Jesus Christ. We aren’t giving Satan the praise, we are just shining the love of Jesus through it all. Our church will be passing these out during the city Halloween event. We see it as sharing the light of Christ where otherwise it isn’t usually found. So many people today have no idea about the origin of Halloween or consider that it was the day before All Saints Day in the Christian church’s calendar. Ghosts and witches costumes have been replaced by the current popular trends of cartoon, disney, or occupational dress. Since Oct 31, 1517 was the date Martin Luther posted his 95 Theses (questions) about the practices of the Roman Catholic Church, many will celebrate Reformation instead of Halloween.